CURACAO: The 17.25MW Tera Kora II project, an extension to two existing projects on the island of Curacao in the Caribbean, has been brought online. The site's five Vestas V117-3.45MW turbines are an extension of the 15MW Tera Kora I and 15MW Playa Kanoa sites completed in 2012. The existing projects use Vestas V90-3MW turbines, according to Windpower Intelligence, the research and data division of Windpower Monthly. Tera Kora II was completed by Belgian firm Aspiravi International and Caribbean developer NuCapital. 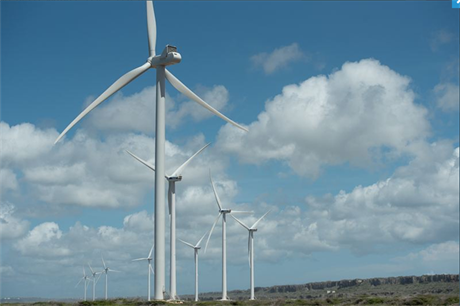 "With the construction of this third wind farm, 30% of today's energy consumption at Curacao is now produced by wind energy. "Moreover, this means that Curaçao's goal of obtaining 30% of its energy from renewable sources in 2020 has already been achieved today," said Aspiravi International as it celebrated the site's official commissioning. Aspiravi International has over 645MW of renewable energy installed, mostly in Belgium.